This North Indian speciality, combining aromatic spices with saffron, has become one of India's most popular dishes. Ideal for making mattar panir (spiced fresh cheese and green peas). Serve with Indian breads or rice. 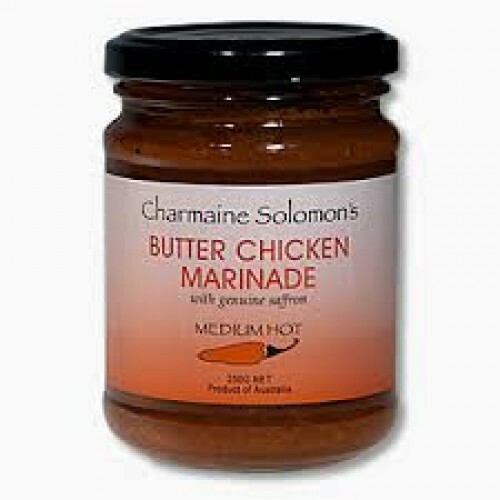 Use Charmaine Solomon Butter Chicken to make the following easy and authentic butter chicken recipe. 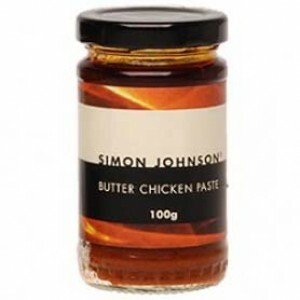 Rub 750g diced thigh or drumstick fillets with 1/2 a jar Butter Chicken Marinade. leave 1 hour, or overnight in the refrigerator. In a heavy pan heat 2 tablespoons ghee and brown chicken, add 1 cup tomato puree and a tablespoon of sugar. Simmer for 20 minutes, or until chicken is tender. Just before serving, stir in 1/2 cup cream and heat through to enjoy a beautiful Butter Chicken dish by Charmaine Solomon. A blend of onion, garlic, ginger, spices, paprika, herbs, ground rice, water, canola oil, lemon juice, salt, citric acid, saffron. No added MSG, Artificial colours, or Flavours, Palm Oil or Trans Fats, Gluten Free.